I was told by Ravi to can the numerology and continue blogging about thermodynamics. Ravi is probably correct but first let’s first look at 11 11 11. Bloom submitted their permit application in Delaware on November 11, 2011. This is 11 11 11. 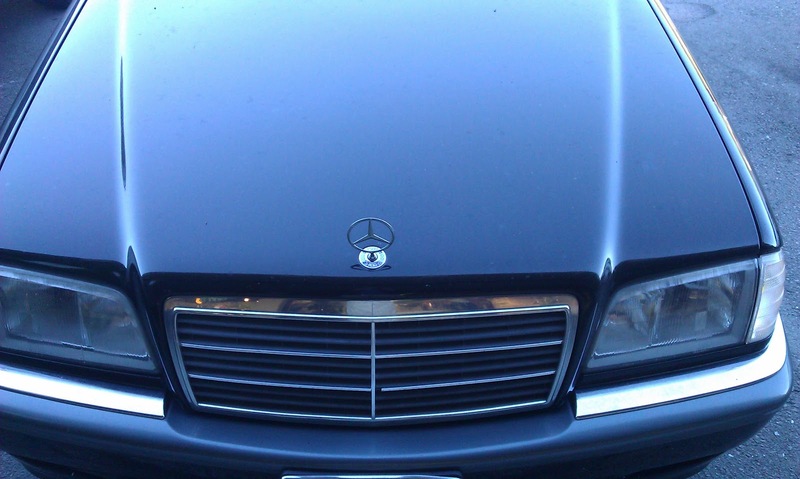 Yesterday I was driving my 1999 C280 Mercedes and I did something I never do. 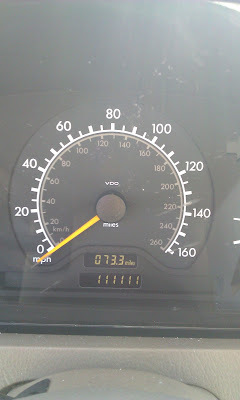 I looked at the odometer of the old car. 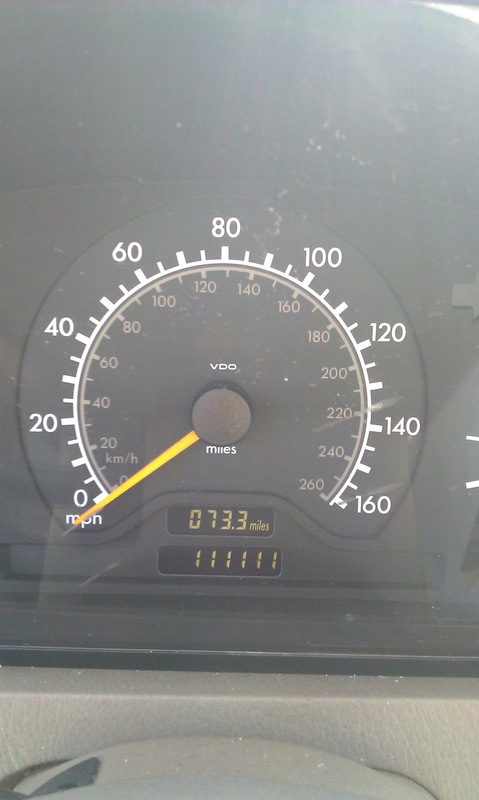 It stood at 111,111 miles. I almost fainted. I stopped the car on the side of California Route 131 and took the photo that is shown above. I actually spooked myself as I do not believe in Feng Shui or numerology but this was just too much of a coincidence. So now back to thermodynamics and pleasing Ravi. Another US Solar PV startup went bankrupt this week. They were Abound Solar. I guess they are now Aground Solar. Of course Chu Chu’s department of entropy gave them tax dollars for their exotic PV technology that is based on Cadmium and Tellurium chemistry. The Chinese bet on silicon and cleaned our clocks while Chu bet on the exotic chemistries like CIGS and CdTe. By the way Cd is atomic number 48 and Te is atomic number 52. 48 plus 52 equals 100 and Abound got their business plan 100% dead wrong. Sorry Ravi I just had to get that into the blog. Once again Chu bet wrong and got completely clobbered by a simple chemical the Chinese now produce in abundance or actually overabundance. The president may be declaring victory in healthcare but he has to admit he really misplaced his trust in Chu on the energy policy. I cannot tell you if forcing folks to buy health insurance is a tax or a penalty. But I can tell that keeping on wasting tax payers money on hair brain schemes is a penalty we cannot afford. Tesla delivered their first vehicles to ten lucky customers. Customer number 7 was Tim Draper one of the principals in Draper Fisher Jurvetson a VC firm that backed Tesla and made a mint out of the IPO of Tesla. Of course Chu did not come to Fremont California to see the handover of the ten cars that are the poster child of the policy to transfer money from the poor to the rich. Tesla promises to deliver 20,000 cars next year at a price of $50,000. I will eat my ten gallon hat if that occurs. Elon Musk the CEO of Tesla made a speech about how NUMI workers are now employed at the Tesla Factory. NUMI was the old owner of the assembly facility. It turns out that a total of less than 50 NUMI workers are employed by Tesla while the NUMI labor force peaked at 4,700 when Toyota and GM owned the facility. Well done Elon you proved the 1% rule by employing 1% of the previously unionized workers and letting the other 99% eat tasty cakes while sitting around dreaming of well paying jobs. I wonder if Tim Draper even gives a thought to the fact that the car he bought for $88,889 (after Federal and State rebates) actually cost $200,000 to produce and that the Secretary of the Treasury Tiny Tim printed money to fund the $111,111 shortfall. By the way Tim’s car is red just like the color of the ink on Tesla’s government funded profit and loss statement. As for my almost 14 year old C280 it is paid for and does not cost the tax payers anything. Its paint is now a fading black but that is the right color ink on how to run a business and a country. 884 is a composite number not a prime number. Its factors are 4,13, and 17 (4 times 13 times 17 equals 884). These are very interesting factors from a lucky or unlucky Feng Shui perspective. • In China and Japan 4 is a highly unlucky number as the Chinese word for 4 (pinyin si) is almost identical to the Chinese word for death (pinyin sii). Multi story buildings in China simply skip the fourth floor in their numbering system. • In the West the number 13 also implies bad fortune. Friday the thirteenth is an example as well as hotels and hospitals skipping the thirteenth floor in their numbering system. • Seventeen is four plus thirteen and is double trouble. In Italy 17 is a highly unlucky number as the Roman numerals XVII mean “I have Lived”. Buildings in Italy skip the seventeenth floor. Taking all the factors of 884 together and noting that each has end of life connotations it is quite amazing that Bloom Energy continues to exist. 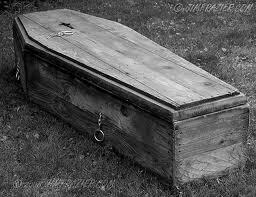 Perhaps the Bloom Box is really a coffin. Go to this link for the full story on why 884 May Become Bloom Energy’s Fatal Number. I did some further reading of the transcript of the hearing held in Dover Delaware regarding the Bloom Energy project in the first state. Rather boring reading but it got exciting around page 153. Mr. Schoell the attorney for the Bloom affiliate introduced one Mr. William Brockenborough, the general manager of Bloom Electronics as a sworn in witness on page 153 line 8 and 9. I remembered the name of the general manager as he was the Bloom official that submitted the now famous November 11, 2011 permit application. I have opined that the permit application was thermodynamically flawed as to the quantity of natural gas versus the carbon dioxide emissions. Mr. Brockenborough submitted that application under penalty of perjury. As a sworn witness at the hearing he again promised to tell the truth and nothing but the truth. On page 154, Mr. Schoell asks Mr. Brockenborough “What are the raw materials used in the process?” Brockenborough replies on lines 16 and 17 “The raw materials used in the process are utility natural gas and air.” I agree the utility will supply natural gas via pipeline to the power generation station and Mother Nature does provide the air. The discussion between Schoell and Brockenborough then turns to sulfur the 16th element of the periodic table. 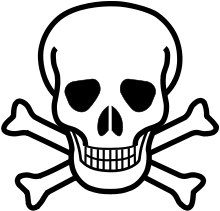 The reasoning for the questions to Mr. Brockenborough was that Mr. Nichols who had challenged the permit application had introduced into evidence the fact that Bloom had asked the State of California to provide Bloom with training money to train Bloom Box operators in the safe handling of hazardous materials specifically hydrogen sulfide (the gas that gives rotten eggs their pungent odor). Then the discussion turns to hydrogen sulfide and on page 155 lines 23 and 24 Mr. Brokenborough states “No there is no hydrogen sulfide used or produced in the process”. This all sounds so simple and wonderful. The only sulfur containing compound in the natural gas is mercaptan that is non-toxic and it is removed by the resin bed and the Bloom Boxes never see hydrogen sulfide and the training that Bloom wanted the state of California to pay for was a mistake on Bloom’s part. Well Mr. Brockenborough you are either ill informed or not telling the truth!!! Pipeline natural gas has hydrogen sulfide and other sulfur containing molecules beside mercaptan! The US EPA http://www.epa.gov/airmarkt/emissions/gasdef.html provides us this data. 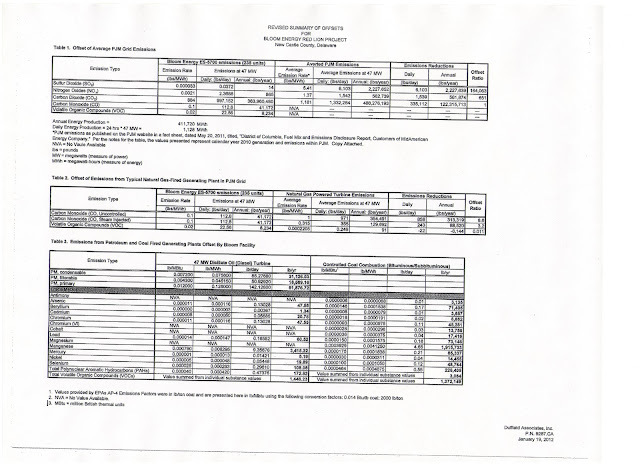 Pacific Gas and Electric http://www.pge.com/pipeline/operations/sulfur/sulfur_info.shtml provides us this data. Any sophomore level engineer knows that there is some hydrogen sulfide in natural gas. Mr. Brockenborough studied electrical engineering at Stanford University. Prior to joining Bloom he was an executive at Chevron. http://www.linkedin.com/pub/bill-brockenborough/1/763/35a How in heavens name did he not know that there is hydrogen sulfide in the pipeline gas he referred to as a raw material for the boxes? Perhaps the Bloom Box is so “state-of-the-art” they only use a resin bed to remove only mercaptan and the stacks can handle hydrogen sulfide, carbonyl sulfide, and other toxic sulfur containing compounds. Or perhaps Mr. Brockenborough is not telling us the truth. Fuel me once shame on you, Fuel me twice shame on me. I am now calling for Mr. T.J. Rogers as an independent board member of Bloom Energy to investigate the whole Delaware affair. I also suggest the attorney general of Delaware start an investigation into the whole project and get to the bottom of all of this. Of course if Bloom has no hydrogen sulfide on its resin beds the attorney general of California should investigate the application for state funds for the training of Bloom employees on a nonexistent hazardous chemical. This reminds me of how as a kid I pressed blooming flowers in a large book and applied pressure from both sides. I have no doubt that the resin bed does trap hydrogen sulfide, carbonyl sulfide, mercaptan and other sulfur containing chemicals and is full of hazardous material. These hazardous compounds in conjunction with the high carbon dioxide and volatile organic compounds emissions of the 235 Bloom boxes should cause Delaware to stop the project. The coastal zone requirements of Delaware specifically exclude any equipment or process that includes hazardous materials, and folks that is why Bloom is hiding the fact they are a rotten egg. Almost a month ago I blogged on energy matters occurring in the First State, or as I now refer to the state run by Mr. Markell as Dealaway. In Dealaway we have the Bloom is off the Rose proposed project to generate high priced and dirty electricity. The Caesar Rodney Institute, and several Delawareans are contesting the deal that Mr. Markell gave away to his friends at Bloom Energy. The first challenge happened in Dover, DE on June 13, 2012 when a hearing was held in front of the commissioners of the Coastal Zone Industrial Control Board. This was the appeal of John A. Nichols CZA Appeal No. 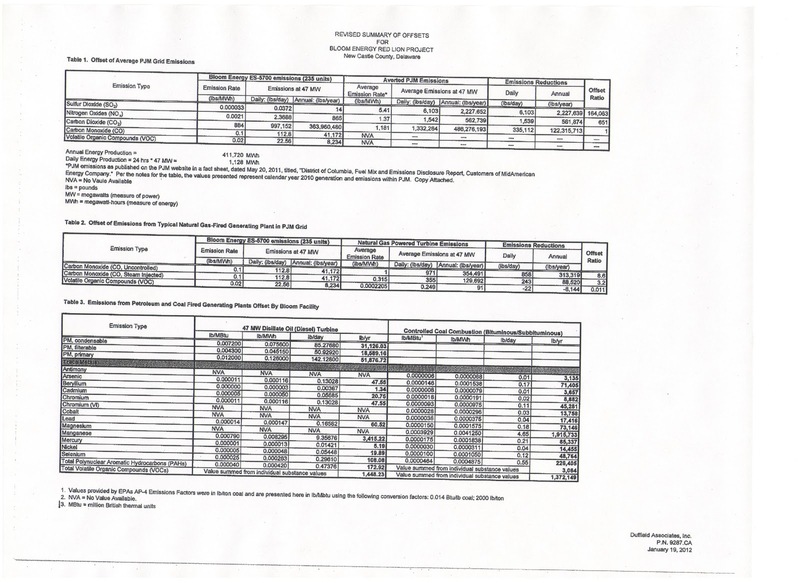 2012-01, and is in the public record. “It does not need to prove it is the best technology. It does not need to prove it is better than anything else.” “It” being the project of the 235 Bloom Boxes to be installed on farm land in the coastal zone of Delaware. This statement of admission of mediocrity and less than state-of-the-art technology from Bloom’s high priced lawyer is what I would call a 180 degree turn from Bloom’s years of claims of being the state-of-the-art method to generate electricity and that Bloom operated at the leading edge. In February 2010 when Bloom launched itself with 60 Minutes did we hear these words of technical incapability? When Bloom raised money from rich individual through Advanced Equities the Chicago firm under SEC investigation did Bloom tell these investors “It does not need to prove it is the best technology. It does not need to prove it is better than anything else.” Hell NO! They told the well-heeled members of the 1%, brotherhood that this is the investment opportunity of your lifetime. They told the prospective investors look at us we have Doerr, Gore and Powell steering the company. Look at us we have the “Bloom Box” that is over 60% efficient. Look at us we are driving the leading edge of greentech. Look at us we outgreen anything else on the market. Well when Mr. Nichols wanted to introduce the fact that Siemens, GE and Mitsubishi offer state-of-art combined cycle power stations that are in fact the best available technology and are better than everything else, Mr. Schoell objected and stated that the Bloom Boxes only need to be compared to the average of the old and decrepit power generation stations on the PJM grid. I wonder if Bloom uses Mr. Schoell when they do presentations in front of prospective investors? No they have some other person in an equally shiny suit selling their leading edge message. Of course Mr. Schoell had on his agenda the mission to compare the Bloom Boxes to the average of an antiquated and outdated power generation system. Of course Mr. Schoell was paid by Bloom to keep the project going so they can pocket high prices for dirty power. No doubt disclosed to investors in Bloom is that the Diamond State Generation Project will bring positive cash flow to the investors. Mr. Schoell’s single mission was to make sure those flows of cash from the 99% to the 1% would not be delayed, diminished or stopped. What a way to run a business! This worse than mediocre enterprise, lives on government handouts, government tax credits, high prices forced on consumers by government, and by investments taken from thermodynamically naïve investors through shady intermediaries. I suggest to Colin Powell that he resign from Board of Bloom Energy as he still has high standing on the global stage. I also suggest to Mr. Markell that he got stung badly by Fisker and he should rapidly prune this bloom and come on over to the right side if he wants to bring Dealaway back to its standing as the First State. Note Fisker and Bloom are both heavily backed by Kleiner Perkins where Mr. John Doerr has Mr. Al Gore on his team. Mr. Colin Powell is a strategic advisor to Kleiner Perkins. 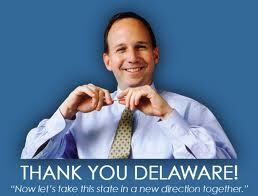 Jack Markell a Democrat is the governor of Delaware and has the slogan “now let’s take this state in a new direction together.” Caesar Rodney was the Paul Revere of Delaware in the American Revolution and really did make it the First State without any clever slogans and crony capitalist friends. We are almost reaching the zenith of the sun’s highest arc in the northern hemisphere and we are still dreaming of greener pastures. Who knows what dreams will be started or ended in the coming week? This weekend the Greeks vote and their dreams are just to survive not to drown in a sea of debt. The dream of a European Union seems to be turning into a nightmare. The dream of millions of green jobs in the developed economies has certainly ended without much success. The dream of the Arab spring of a year ago is fading rapidly into civil wars and overturned elections by the hands of the military. The dream of economic growth in the OECD has all but evaporated. For A 123, Ener 1, Valence, and the US DOE it was a short dream of competitive lithium ion batteries produced in the USA. For First Solar it was also an abruptly ended dream when their Cadmium Telluride PV technology got stomped on by cheap and probably government subsidized Chinese silicon based cells. First Solar had enjoyed the position of lowest cost manufacturer of PV cells till about a year ago and then they simply hit a wall in being able to reduce production costs. The Chinese simply give away their silicon cells at or below cash production costs. I do believe the President did start out in 2009 with an honest yet naïve dream that he could successfully steer the US away from fossil fuels and could create a couple million jobs in the new green industries. The President never did study thermodynamics and he selected a Secretary of Energy who certainly did. What the President did not know was that his choice for Energy Secretary would end as it did as a nightmare with tens of billions of dollars hopelessly spent on failed companies and technologies. Thermodynamics is not based on dreams, it is basically the force in the universe that limits the free ride. I have oft blogged that I told the US Senate almost three years ago that thermodynamics would constrain the adoption of the electric vehicle. Perhaps the Green Machine should have gone right to the top and rather should have written to the President and informed him of the pitfalls of funding A 123, Fisker, Tesla, Ener 1, and others. To be fair to the President, his predecessor also gave away billions of wasted dollars for the hydrogen and ethanol economies. To be fair to Chu Chu he is no worse than Sam The Sham Bodman another PhD (chemical engineering) who forgot his sophomore year studies of Kelvin, Carnot and Gibbs. Chu Chu is just a thoroughly incompetent manager and was completely clueless of the global competition that cleaned our collective clock. Now as we move forward and want we need competence and we need a transparent and thermodynamically honest energy policy. President Obama must stop blaming his failure on what he inherited. If he prevails in the election he has to find a new and highly competent Energy Secretary. If he fails to win reelection, his opponent better select an Energy Secretary who is both knowledgeable but also more importantly a highly competent manager who is aware of the global competitive landscape. 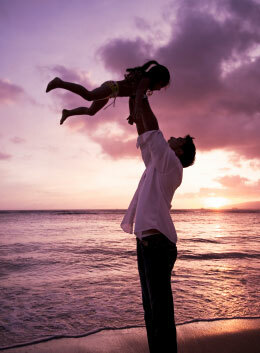 On this Father’s Day in mid-summer, I do dream that my child and her yet to be born children will have a life as nice as I have enjoyed, and that she will not be relegated to living in a minor province of China. We cannot afford misguided energy policy any longer!! Bloom Energy claimed 60% efficiency when they actually only had 45.2% efficiency. But Bloom is not the world’s biggest fibber. That honor goes to the US EPA. Has the Green Machine lost it? Is he cozying up to Al Gore and Colin Powell? Is he just plain nuts? None of the above! The Green Machine is now exposing how the US Government can choose to create data that disobey the laws of thermodynamics so that the worthless government policy of favoring plug in vehicles over gas or diesel powered vehicles can be supported by the public. Yes the US EPA chooses to make 34.4% equal to 100%. Is this just another way for a do good government to dictate that the least smart student in the class gets an A. The socialist inspired nincompoops at the EPA believe the plug in needs higher grades just because three Nobel Prize winners told them so. Two of the prize winners won for peace the other for physics. All of these calculations are in fact flawed as the generation of electricity, the transmission and distribution of electricity, the conversion of the AC electricity into DC electricity, and the charging and discharging of the vehicle batteries all have energy losses associated with these activities. The average efficiency of power generation is perhaps 42.5%, the transmission and distribution efficiency is perhaps 90%, the AC to DC conversion and the battery charge discharge efficiency is about 90%. Multiplying all these efficiencies one can calculate that the overall efficiency is 34.4% to get electric power from fuels at the power station into stored electrons within the plug in vehicle’s batteries. On this basis the 118 MPG equivalent is 40.6 MPG actual for the Honda Fit which is not much of an improvement to the gasoline version of this vehicle that has an EPA rating of 35 MPG combined for city and highway driving. Yes Bloom can make 45.2 equal 60 but your government does even better it makes 40.6 equal 118. Bloom fibs by a factor of 32% while the government fibs by a factor of 190%. That is because Bloom does have a few folks who came from the private sector that President Obama believes is doing so well. As soon as Bloom gets more ex politicians on their board the amount of fibbing will increase. When bloom is entirely “government owned” it will be able to generate electricity in Delaware with 131.3% efficiency. The boys at Teslacle have provided some ammunition for the Green Machine. They have provided a computer simulation of the range the Tesla S will attain with the 85 kilowatt hour battery pack and using the EPA’s new 5 cycle test method for electric vehicle operation. When the Tesla Roadster was certified, the EPA only used a 2-cycle test that was carried out under conditions of 75 degrees Fahrenheit ambient temperature and with varying acceleration rates and driving speeds for both city and highway tests topping out at 60 mph. Recently, the EPA incorporated three additional cycles into their tests that push vehicles to greater limits. The additional cycles added as part of the new “5-cycle test” include a cold driving cycle that requires heater use, a hot weather cycle with air conditioning operation, and a high-speed cycle (reaching 80mph) with rapid accelerations. Ok we have that the S attained a range of 265 miles with 85 kilowatt hours of batteries. This is 321 watt hours per mile of DC power. Power is generated as AC at the power station and with transmission and distribution losses as well as the conversion of AC power to DC power we must add 15% to the watt hours per mile to calculate the energy usage in AC current. 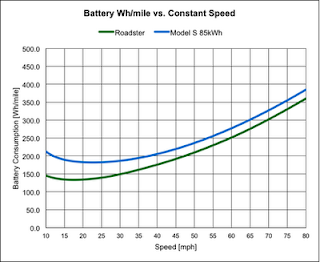 Therefore 369 watt hours of AC power are needed per mile for the Model S under the more realistic 5 cycle EPA test. The average 1,000 watt hours of power generation in the US emits 1.2 pounds of CO2. Therefore the CO2 emissions of the Tesla Model S that will go on sales later this month are 0.443 pounds per mile. A standard hybrid Prius gets 48 miles per gallon (source EPA) and a gallon of gas emits 19.564 pounds of carbon dioxide (source WRI). Therefore the standard hybrid Prius emits 0.408 pounds of CO2 per mile. Of course there are added emissions to explore, produce crude oil, transport crude oil and refine the crude into gasoline. Likewise there are added emissions to mine coal and transport the coal to the power station, or to explore, produce, compress, and transport natural gas to the power station, or mine uranium, enrich uranium and transport the uranium to a power station. On this basis let us stick with the simple analysis above where the Tesla Model S emits approximately 10% additional CO2 per mile than a Prius Hybrid. Mr. Obama and Dr. Chu I am therefore asking you to give a Federal tax credit of S7,500 to each person who purchases a Prius Hybrid just as you give this amount to each person who purchases a Tesla Model S. Actually the tax credit for the purchase of a Prius Hybrid should be $8,250 to account for the additional emissions of carbon dioxide the Tesla Model S puts into the atmosphere. If Mitt becomes the president next year I am sure he will listen to my sage advice. Now I am really dreaming. Mitt will simply triple the tax credit for the rich person who buys the Model S and will tell the purchaser of the Prius Hybrid to walk more frequently if they want to save money. Mitt Antoinette will stand on the portico of the White House and tell us we are bloody fortunate to have a guy who knows business in charge of the country and Wonder Bread is good for us. Our Morton’s fork choice is between a private equity guy with green in the bank and a guy who is green between his big ears even after almost a full term in office. I doubt I will ever have enough money again to eat at Morton’s Steak House. God Bless America while we the 99% eat pink slime!!! In a couple of years Wendy’s will bring out a new ad on Facebook groups targeted to the senior citizens that has an octogenarian who asks “where’s the pink slime?” Folks we are in a burger joint of a Presidential race that serves only buns made of Wonder Bread and there is no meat. Mitt clinched the GOP presidential candidate nomination this week and used the occasion to make a speech on jobs in front of the now closed Solyndra facility in Fremont California. Mitt could have gone about 1 mile further north on the 880 freeway and could have made a second speech about an even greater waste of money at the Tesla factory that will soon “spit out” model Ss for the masses. Yeah as Steve Tyler said “dream on”. The first Model S will have the 84 kilowatt hour battery packs that will give them some range and will be the $90,000 version of the “people’s car”. Of course Mitt is all for taxing the poor to pay the rich so he actually agrees with Barak on Tesla and would never make a speech in front of the Tesla factory that is using tax payer dollars to subsidize the cost of toy cars for the wealthy. 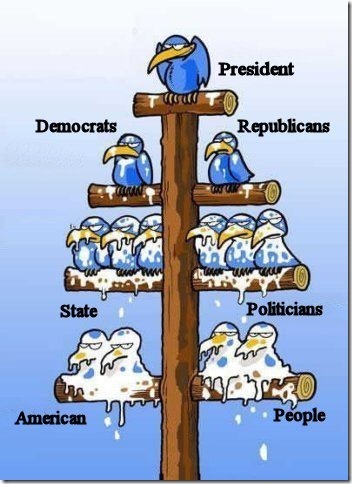 Folks our political system is owned by the 1% who have bought the parties of asses and elephants. Just before Mitt came for his fundraiser in the Bay Area, Barak was here in the Bay Area for the very same reason to raise campaign money. 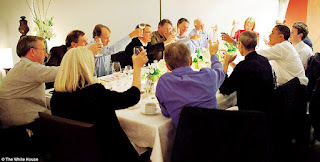 Barak’s visit was precisely one year after his big dinner at John Doerr’s house with the late Steve Jobs and other Silicon Valley heavy weights to talk about how to stimulate the economy and create jobs. Interestingly Barak sat between the late Steve Jobs and the kind and gentle CEO of Facebook. Yeah Facebook had it IPO and it was a total sham, fiasco, and rip off of the public. I think they made IPO stand for It’s Pricy and Overcharged. The Facebook IPO was another perfect case of the 1% totally taking the other 99% of small shareholders for a ride. Perhaps the Facebook ride was purely electric and without tailpipe emissions. The President did not use his recent visit to the Bay area as a photo opportunity to be with Mr. Zuckerberg, as the President knows when we have been zucked. Other than Zuckerberg and his CFO Ebersman, I have to say the Obama Chu combination has zucked more people in so short a time. I am not sure that Mitt and whomever he has an energy secretary will stop zucking around and actually propose an energy policy that obeys the second law and gets us moving again.